Speed 60-80 Packs per minutes. Accommodates wide range of sizes. Film rolls feeding from top or bottom depending on the weight, size and shape of the product. Variety in fin and end seal patterns. Nappy pads, foods, cakes, Chocolates, biscuits, Tissue paper, confectionery, electrical switches, petroleum jelly large Bottles etc. Jet Pack Machines Pvt. 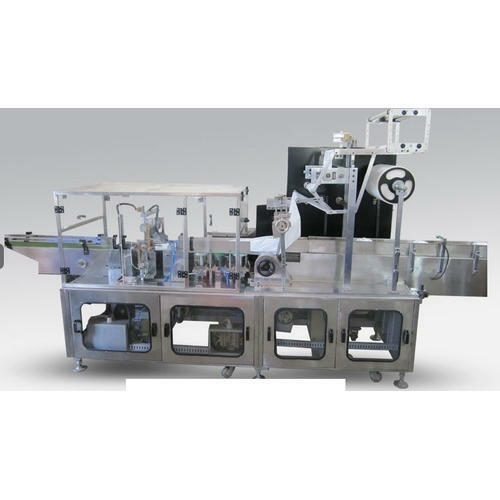 Ltd. is the well-established manufacturer and supplier company that ought to seek perfection in its offered Filling and Wrapping Machine since the established in 1994. With steady growth in every aspect of our enterprise services, we are expert in delivering out a broad array of high performing machines such as, Powder Filling Machine, Cream Filling Machine and Perfume Filling Machine. We have grown to be an esteemed name in the industry, as our offered machines are produced with quality certified parts and sub serve the benefit of low-cost performance, durable structure, easy installation and hassle-free maintenance. We work to uphold the goals of esteemed patrons, which assist us to understand their evolving demands. In addition, we recognize technological innovation is a necessity to our operational supremacy. We have implemented high-speed machinery layout which performs efficiently to produce user-friendly and high working machinery. And to produce the highest functionality, we are teamed with a trio of hard-working personnel, who are dedicated to exceeding the demands of producing hi-end machinery. Apart from this, our command values and policies of addressing client focused decisions outfit us to make sensible use of our resources and to create the long-term bond with our esteemed clients.